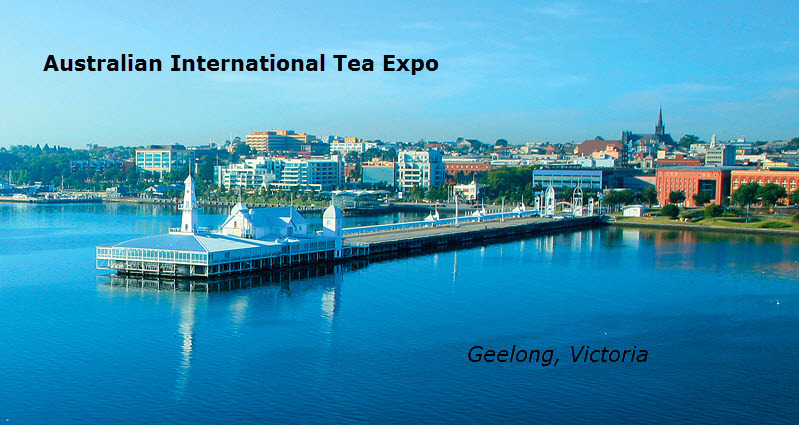 The Australian International Tea Expo October 17-18 is Australia’s first specialty tea trade show and conference. The resort town of Geelong, Victoria, about 45 miles from Melbourne, is the location of the inaugural trade show and conference which includes a tea education program and a black-tie Golden Leaf Awards dinner. Tea classes will be held throughout the show from 10 am to 5 pm each day at the Geelong Boat House, according to Sharyn Johnston, founder of the Australian Tea Masters Association, which is organizing the event. The event is destined to become the “epicenter for tea specialists and tea products in Australia,” according to Johnston. “Industry professionals and tea enthusiasts will connect face-to-face to unveil new products, optimize high quality merchandise, gain in-depth product knowledge, and network with their tea loving peers,” she said. The Golden Leaf Awards is a new competition, judged by professional tea cuppers, to distinguish the highest-quality and best-tasting teas commercially available in the Australian marketplace. Several categories within each class of tea will be judged during October prior to the expo, and the winners will be notified the day before the event. Winning companies receive a formal announcement letter that includes the tea’s scores, as well as a print-ready seal that can be used for all promotional materials and packaging. For more information, click here. The awards will be presented during a formal black tea dinner at the Novotel Geelong on Oct. 17. The dinner will feature a delicious menu with each course paired with the perfect tea. The banquet includes cultural entertainment. To reserve a seat click click here. Johnston said the event will help Australians discover and experience specialty tea while celebrating the cultural diversity of teas from around the world. Plus many forms of entertainment including traditional Japanese tea ceremony, Korean Tea ceremony on the main stage, in the middle of the Expo hall. Help support the fight against ovarian cancer by attending our Frocktober morning tea. Find out more here. To register to exhibit, click here. Tea Biz serves a core audience of beverage professionals in the belief that insightful journalism informs good decision-making in business. Tea Biz reports what matters along the entire supply chain, emphasizing trustworthy sources and sound market research while discarding fluff and ignoring puffery. Tea Biz posts are available to use in your company newsletter or website. Purchase reprint and distribution rights for single articles or commission original content. Click here for details. DUBAI, UAE – India’s great wealth of tea gardens and expertise extends far south of the fabled Himalayas. Golden Leaf India Judge Kurush Bharucha (foreground) and Sanjay Sethi (background) sip and slurp. Last week, judges of the Golden Leaf India Awards announced 34 outstanding teas in multiple categories as winners of the annual competition. 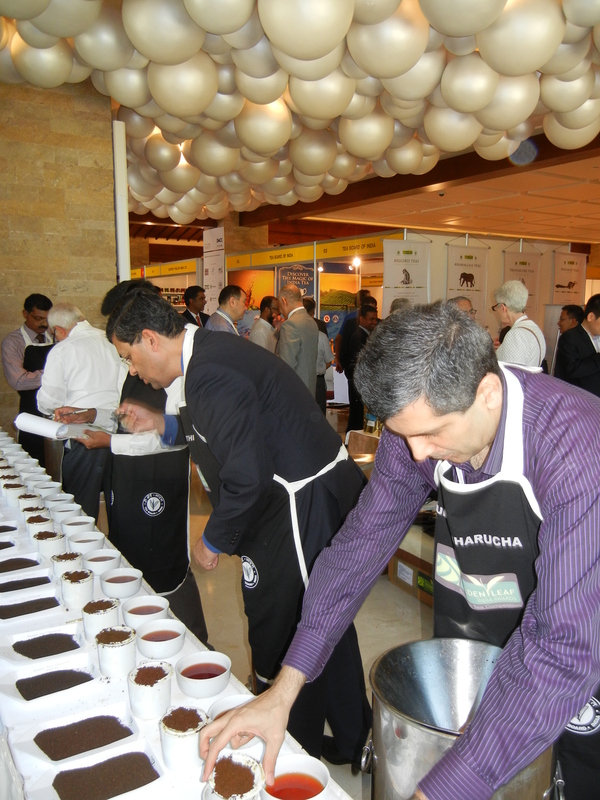 Judging took place at the 5th Global Dubai Tea Forum April 9th. Categories include traditional fannings and orthodox black pekoe and broken pekoe teas along with a test of skill in green tea making. Kanan Devan Hills Plantation won six Golden Leaf Awards, three each from both CTC and Orthogox categories from its factories located in the High Ranges of Munnar in Kerala, India. KDHP is the largest tea plantation company in South India garden and the largest producer-tea exporter in South India with an annual production of 25 million kilos. The plantation spans 23,000 hectares. “This has been a testament to KDHP’s efforts on quality enhancement over the years as we won an unprecedented 6 awards in each of the categories that we entered, which no one else has managed thus far,” Chacko P. Thomas. The total brings to 29 the number of Golden Leaf trophies awarded KDHP. 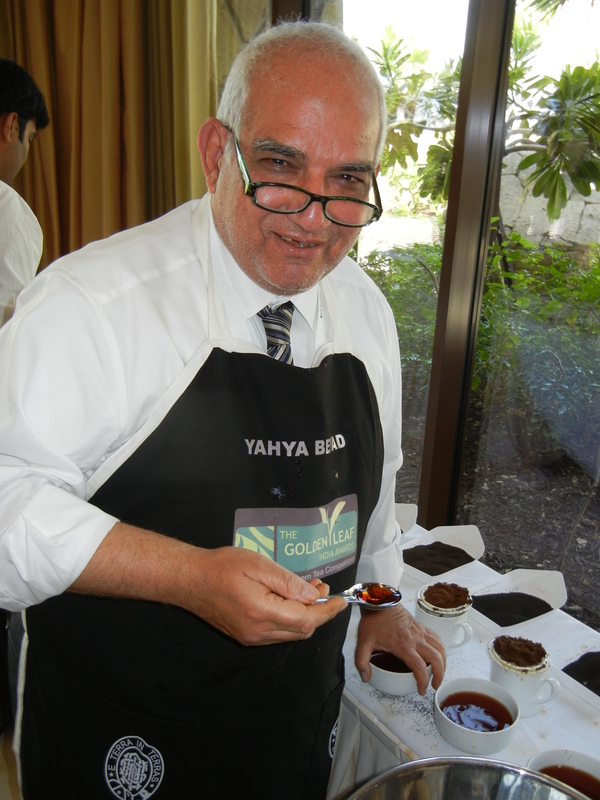 Golden Leaf India Judge Yahya Beyad, owner of Britannia Teas stands over the spittoon. Wentworth and Woodbriar Estates, also in Kerala, each won three Golden Leaf trophies to net the Woodbriar Group a total of six. The Harrisons Malayalam Ltd., Tea Company took home four prizes and Devon Plantations & Industries, Vigneshwar Estate, Koadanad Estate and Joonktollee Tea & Industries each received three of the attractive trophies. The prizes for best green teas when to Bluegate Beverages in the Nilgiris for its whole leaf and to Poabs Organic Products for its green tea fannings. The competition is a joint initiative of the Tea Board of India and the United Planters Association of Southern India (UPASI). The panel of judges included Sanjay Sethi, Moshin Saify, Yahya Beyad, Kurush Bharucha and Mike Jones. 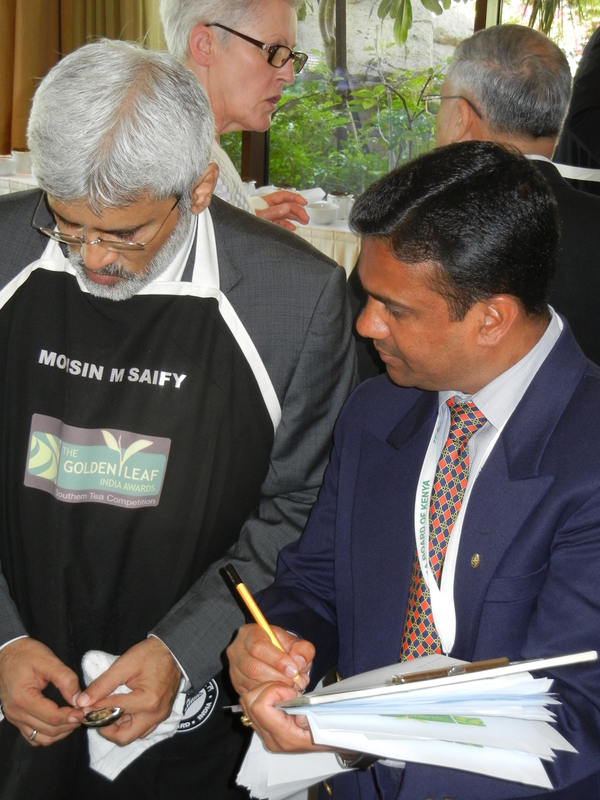 Golden Leaf India Judge Moshin Saify reports his scores. Indian tea is grown at elevations of 7,500 meters, as high as any in the Himalayan foothills and the plantations date to the late 1800s. South India teas are known for their aroma, balanced astringency and lingering aftertaste. This awards event was first organized in 2005. The judges gave high praise to this year’s competitors. Presentation of the awards concluded the Dubai tea conference with 300 attendees offering an enthusiastic round of applause. The victors return to Munnar, Conoor, Annamallais and Wandiperiyar with trophies for their display cases and the knowledge their teas rank among the best India has to offer.